A simple solution to rouge faucets and stuck spouts. Are you having trouble with a faucet in your house. Maybe it's leaking, the water isn't flowing well, or squirting out to the side funny. 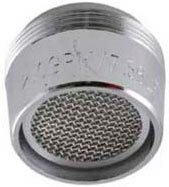 This is usually caused by mineral build up in the faucet's aerator screen. Repairing a rouge faucet can be a pretty simple project, that is, if you can get the spout unscrewed without scratching or completely destroying it. Here's a quick and easy solution to help you successfully unscrew a stuck or overtightened spout. First, to prevent scratching, wrap the rag once around the spout. Adjust your pliers and apply them to the rag around the spout. Next, slowly and carefully turn the spout clockwise and it will come loose. Now unscrew the spout with you fingers, being careful not to loose any parts. DIY Tip: Make sure you close off the sink drain. If you don't and small parts fall into the sink, you'll run the risk of losing parts (or even your ring) down the drain. Trust me on this! Now that you have the spout removed you can use the toothbrush to clean out any debris in the screen, rinse the screen (and the other parts well) and then reassemble in reverse order. Remember to use the rag again when you tighten the spout with the pliers -- and don't over tighten, it only needs to be snug. Here's one more great DIY tip to help you succeed with speed. Thanks for these tips for repairing a rouge faucet. I will surly apply these tips this time. I’ happy to be of help and thank you for visiting my site. Let me know if you need help on any of your upcoming DIY projects. © 2017 DIYAnswerGuy.com All rights reserved.